Get it? Kind of like bittersweet but butternut. Stretching it too far? Maybe. At any rate we've so enjoyed this CSA season and we're just a bit sad it's coming to an end - but the end of one thing means the beginning of the next! We'll still be at market and we're excited to gear up for our fall/winter CSA season and all the good things that will happen with that. We'll be harvesting tomatoes, peppers, okra, cow peas, summer squash, butternut squash, delicata squash, baby greens, onions, and basil for CSA boxes and market this Saturday. 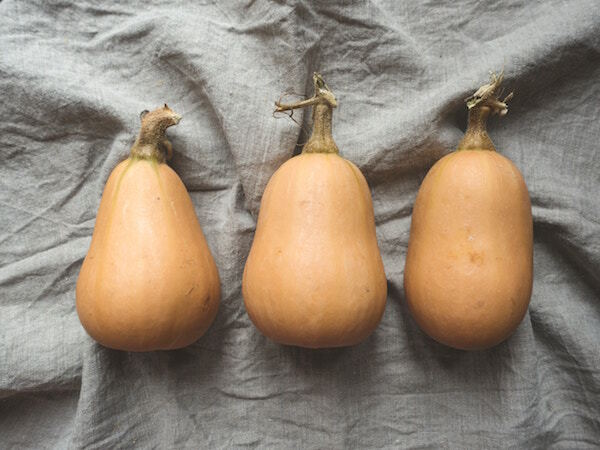 And back to the butternut squash - this delicate yet hearty squash is a harbinger of what's to come in the fall - and a really simple way to prepare it is to roast it! Peel the squash with a vegetable peeler and take off the stem, then with a sharp knife and steady surface, carefully cut it in half. Scoop the seeds out, then cut the squash into 1" cubes. Heat the oven to 400 degrees. Toss the squash with olive oil, salt, and pepper and transfer it to a large baking sheet in one even layer. Roast at 400 degrees for 30-40 minutes, until it's fork tender and golden brown. Let it cool...then eat it! You can drizzle it in butter and sauteed sage and eat it, smush it up it to make ravioli, blend up a delicious bisque, or make a yummy salad.